Falvey Memorial Library :: International intrigue! 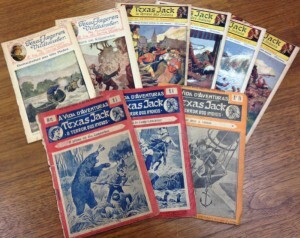 We recently received a shipment of international dime novels from a seller in The Netherlands. 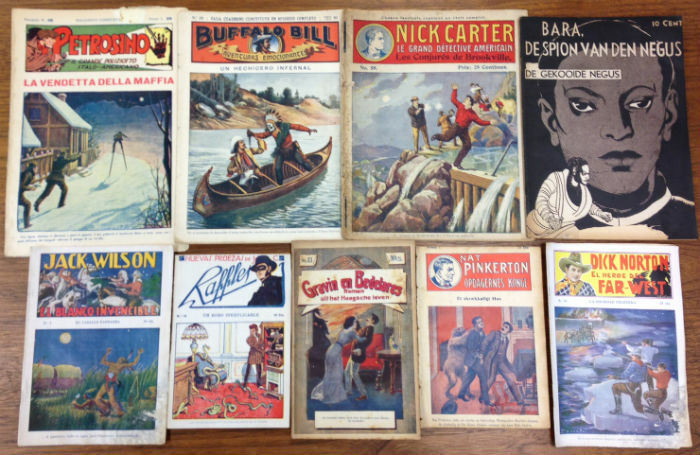 We are now the proud owners of dime novels in Dutch, French, Italian, Portuguese, and Spanish, as well as a smaller number of titles in Polish and Swedish. “Texas Jack” titles in several languages. Most of the covers are full of vibrant colors depicting graphic scenes of mischief and mayhem. Many of the illustrations are quite violent and full of the racism that was common at the time these were published. One title in Spanish has already been digitized and is now viewable online: Un hechicero infernal (in English: “An infernal sorcerer”). We will, of course, be digitizing more over time. 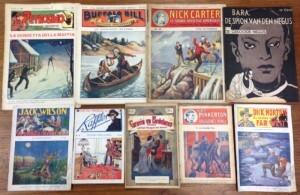 A selection of international dime novels.